I was casually browsing the interweb looking for inspiration (as is my wont on quiet, rainy days) when I stumbled upon an article from Country Living magazine featuring the pretty East Sussex home of one of my favourite contemporary artists, Jessica Zoob. At the bottom of the page were the magical words: "Jessica Zoob's Lewes home is for sale here". Rather too excitedly I followed the link, eager to see how this inspiring painter lives. I have to say I was quite surprised. Given the huge scale of the art that Jessica produces I was expecting a home of similar proportions but instead this four bedroom house, built in the late 19th century, is rather modest. 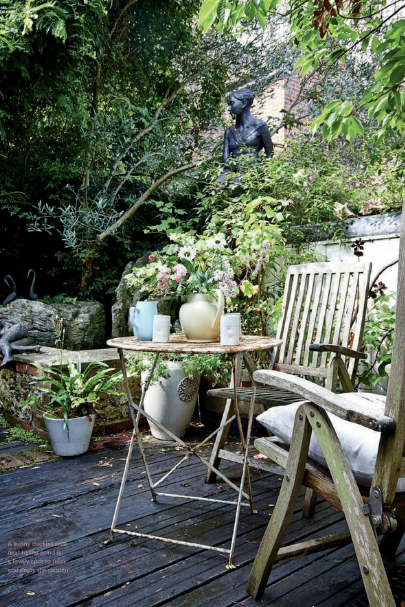 Decorated mostly in white and accessorised with delicate pastels this quirky property is a vintage-lovers heaven. Jessica's dreamy artworks complement the furnishing throughout, although sadly I suspect these are not included in the sale or we'd be looking at a figure substantially more than the £695,000 asking price! As with any home storage is paramount and here every nook and cranny has been adapted for that use. Bespoke cupboards are cleverly concealed behind tongue and groove doors, each fitted with spring catches so as to disguise their true purpose. The galley kitchen is small but functional, once again fitted with bespoke units to fit the space, and it also has what the agent adorably describes as a 'hobbit door' leading to an area for bins and recycling. 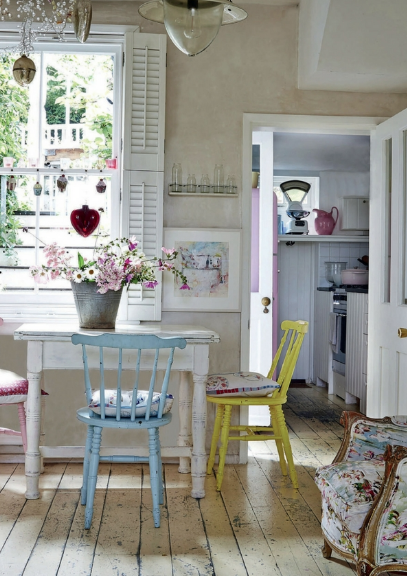 It has the look of a well-loved family home as the scuffed, paint-spattered floorboards testify. With two young daughters Jessica couldn't allow herself to be precious about anything and I think this really adds to its charm. A home is meant to be lived in and this one is a fine example of one that has been just that. Hers is a lifestyle that I can definitely get on board with. I had better get my brushes out if I want to be the next artist in residence!